Prior to the important clash at Anfield on Sunday, Liverpool's Raheem Sterling was awarded the European Golden Boy award. The 20-year-old is only the second Englishman to scoop this honour. Wayne Rooney won it after bursting on to the world scene in 2004. Last season, Brendan Rodgers' Liverpool came within touching distance of the Premier League trophy and Sterling played a huge role alongside SAS (Suarez and Sturridge). Thus, in April 2014, he made it to the shortlist of six candidates for the PFA Young Player of the Year award. Sterling bagged a total of 10 goals in all competitions, last season. This time around, he already has five goals to his name. 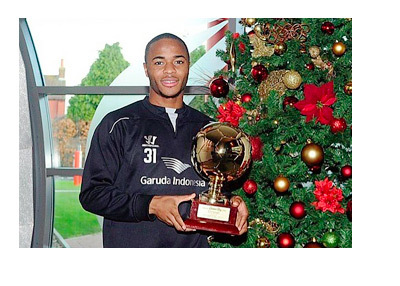 After receiving the award, Sterling told Liverpoolfc.com: "It's a great achievement to win such an award." "It's a really happy feeling for me and my family, of course. Something I've always wanted to do is to work hard playing football and try to be recognised. I'm really grateful that people have shown me this recognition." "It's down to hard work. I'm really happy that people are recognising that I'm trying to work hard and do my best for this football club. I'm really grateful for this award." The England International also claimed that there is a room for improvement and he could get on the score sheet more frequently. He said, "There's always room for improvement. At this moment in time, I should have a few more goals, but I've not taken some of my chances. But I'm young and learning all the time." "This award just shows that hard work gets you where you want to be, and that I'm on the right track for where I want to be in my career. Hopefully I can just keep working hard and try to take my game to the next level." Sterling is the first player to win the award while playing at Liverpool. His teammate Mario Balotelli won it in 2010, while he was at Manchester City. The other players shortlisted for the award included Manchester United's Luke Shaw, Everton's John Stones, Arsenal's Calum Chambers and Tottenham Hotspur's Eric Dier. The highly rated Belgian International, Adnan Januzaj, was also among the favorites to win the award. Ahead of the game against Liverpool, even Arsenal's veteran manager had nothing but praise for the 2014 Golden Boy award winner. In an interview, Arsene Wenger said: "I rate him highly, Sterling." "Everybody speaks about [Luis] Suarez last year, but let's not forget [Daniel] Sturridge and Sterling are very, very influential." "I think he is one of the great players in England." Raheem Sterling has now also become an integral part of the England National Team. The winger attended the World Cup in Brazil and was also active in the 2016 European Championship qualifiers. A lot of clubs in England and abroad are keen to steal him away from Anfield and apparently the Spanish giants , Real Madrid, will place a bid in the transfer window. It will be quite interesting to see how Liverpool manage to keep their prized possession, if they fail to qualify for the Champions League next season. The accolade is voted for by the journalists and is given to the best player under the age of 21 in a top-flight European league. The first of this kind award was presented in 2003, which was won by Rafael van der Vaart. Ex-Manchester United midfielder, Paul Pogba was the recipient of the award in 2013. Lionel Messi, Cesc Fabregas, Mario Gotze, Sergio Aguero and Isco are among other notable names to receive this honour. Only the 2008-10 winners (Anderson, Pato and Balotelli) have had a downward graph in their performance, since receiving it.